In order for couples to marry in the State of Florida, they need a marriage license. The cost of the license is $93.50. * Most of the fee goes to local charities. There is a 3 Day waiting period for Florida residents. Even though couples will get their license immediately, there will be a 3 day waiting period for the license to become valid. This means Florida residents cannot marry until 3 days after receiving their marriage license. In order to become legally married in the state of Florida both bride and groom must apply for a marriage license in person. There is no residency or citizenship requirement to apply for a Florida marriage license. After a marriage license has been obtained, the marriage ceremony can be performed. The marriage ceremony must be performed within 60 days of the issuance of the license. After the marriage ceremony, the party who performed the ceremony should return the license to the Marriage License Bureau. The state requires all Florida residents to take a four hour premarital course or wait three days for the marriage license to be effective. This does not apply to non-Florida residents. A directory of premarital course providers is available online or at all district court locations. When applying for a marriage license both bride and groom must apply in person. If one or more of the applicants are minors, under 18 years of age, additional requirements apply. One (1) valid identification is required with the applicant's picture, signature, and date of birth, a Driver License issued by any state in the U.S., Passport, a U.S. Military ID, Alien Registration Card, or State of Florida ID issued by DMV are acceptable. Anyone issued a Social Security Card must provide their number. Non-U.S. Citizens may provide one of the following valid Identifications: Alien Registration Card, US State issued Driver's License, or Passport if they do not have a Social Security Number. If either applicant has been previously married, the exact date of the last divorce, death or annulment must be provided. If the divorce took place in Miami-Dade County go to the Family Online Case Search and view the docket link for final judgment date which is date of divorce. 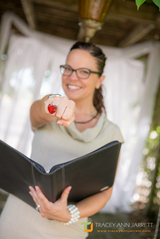 After your marriage is solemnized by an authorized wedding officiant then your officiant must sign, seal and complete the marriage certificate. Also, you can use 2 adult witnesses. 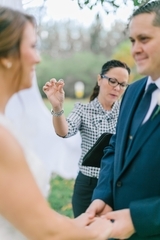 Your officiant can summit the marriage license to the county of origin within 10 days unless you need your Marriage license right away for insurance purposes or any other paper work then I suggest for you to file in person and buy extra copies. Any County Clerk’s Office is pretty overloaded and they may take as 4 to 6 weeks to complete the recording process. Don’t panic if you have been married for as long as few months and your marriage is still not yet recorded. It will be the County Clerk is a governmental agency and so they do things at their own pace.